Following is a recent interview with Paul Castellani. A. I’m a native of the Syracuse, New York area. But from the ages of nine to twenty-one, I spent every summer living and working in an Adirondack resort town not unlike the setting of Sputnik Summer. And my family owned a cottage colony very similar to the one in the novel. So, I’ve always thought of myself as growing up in the Adirondacks. I’ve have been writing all my life, and I’m the author of several articles and two books on public policy. When I turned more toward fiction, the lessons learned in writing good non-fiction made the transition easier—albeit still challenging. Write, revise again and again, get good independent readers and editors and learn to live with rejection and deferred gratification. Q. Tell me about Sputnik Summer. A. 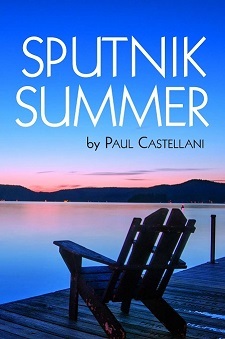 Set in an Adirondack resort town in 1958, Sputnik Summer is a story of what happens when simmering tensions between tourists and the folks who rent to and wait on them every summer boil over. A homicide, a priest on a crusade against Communists and degeneracy in the library, and a girl who says she’s pregnant force characters to question whether they can trust their friends. They worry about what secrets could ruin their lives if revealed and grapple with what lies will they tell to get what they want. Q. Does Sputnik Summer have a theme? A. I shy away from beginning a novel with a theme or a moral or a program in mind. Nonetheless, I’ve always been interested in people on the margins: people trying to move up; people trying to keep from falling back; and people caught in between. So, I think about characters and situations in which this struggle on the margins is central to the story. The protagonist in Sputnik Summer, Kevin Boyle, is seventeen years old, so he’s coming of age – coping with the challenge of becoming an adult. He wants to move out of his small town. And in his desire for more excitement in his last summer in Hawk Cove, he leaves his college-bound friends behind and joins the town’s faster crowd. Running a resort and having the stability of his father’s teaching job puts Kevin’s family a little farther up the ladder than many others in Hawk Cove, especially those who scrabble to get in the twenty weeks that qualify them for unemployment checks that will carry them through the winter. And in every resort town, there is an underlying tension between the “natives” who rent to, wait on – and often resent – the tourists who take over their town every summer. All of these are problems of being on the margins and moving from one situation to another – and they all spell trouble for Kevin. Q. Was there one thing that stimulated you to write this novel? A. A tourist-townie baseball game that ended badly. I played on the townie side in a game not unlike the one in the novel. It was a one-off, not an annual event as in the novel, but it ended in an obscenity-laced fist fight between a kid I was palling around with and a tourist. There I was standing on the margin, the son of the owner of a cottage colony, watching my summer pal (whose single mother was a waitress) cursing the tourists, who were “demographically” closer to me than I was to my pal. I remember being confused, disconcerted. My pal was clearly out of line, but he was my pal. The memory ambushed me on and off for fifty years. Finally, I decided that there was the core of a novel in that time and that setting. I started Sputnik Summer “in the middle” with that pivotal episode and wrote up to it and then its aftermath. Q. You’ve spent most of your career writing non-fiction. Why did you decide to write a novel? And how different was it to write a novel instead of an academic book or article? A. When I was in grad school, a professor told a class of would-be academics about to enter the world of publish or perish, “Remember, you’re telling a story.” Good professional, non-fiction writing tells a story and has most of the elements of good fiction, especially a narrative arc but also a keen awareness of the audience. Even though I’ve spent most of my life reading and writing professional, academic literature, I’ve always read as many novels as possible. I think that for many readers of novels, there comes a point when you say, “I’d like to do that.” Or less-humbly, “I can do that.” So, a number of years ago, I began doing creative writing: snatches, bits, false starts, even a “starter” novel which will remain locked in a bottom drawer. As one phase of my career was coming to a close, I came to a crossroads of sorts. I had a couple of ideas about another non-fiction book. I knew what would be involved in research, interviews, writing, etc. It would probably be at least a five-year project – and it would surely be the last one of that sort I would do. Or, I could devote my time to writing fiction – and I could see myself doing that for as long as my wits held out. And I wanted to do something different. I considered a low-residency MFA. Instead I dug into the literature on writing, attended workshops, subscribed to journals on writing and kept up with several on-line sources. I still read a lot of the writing on writing. And very (if not most) importantly, I found a committed critique group. In my previous (non-fiction) life I learned that you can’t – or shouldn’t try to – do it alone. Good writing depends on having trusted outside readers and editors who will tell you what works and what doesn’t. My excellent critique group gives me rigorous readings and insightful suggestions for improving what I thought was terrific stuff. Professional writing taught me humility and patience which I hope served me well here. And, especially important, is a supportive wife who is a great reader, and when called on to edit the penultimate draft shows no mercy. Q. The chapters of Sputnik Summer are days of the week: Sunday, July 13, for example. But you also have “headlines” and slogans for each day. Tell me more about this. The Soviet Union launched its third Sputnik on a huge rocket with ICBM capability. The French Fourth Republic fell, and General Charles De Gaulle assumed power. Vice-President Nixon’s motorcade was stoned in Venezuela. In May, 69 people were killed in one of several airline disasters that year. Communists scored big election gains in Italy and Finland. A civil war raged in Lebanon, and President Eisenhower sent in the Marines. Turkey invaded and occupied half of Cyrus. Governor Orville Faubus and President Eisenhower were battling in court over the integration of public schools in Little Rock. The Soviets pulled out of negotiations in Geneva over Atomic Bomb talks. The Iraq government was overthrown in a Nassar-backed coup. Castro’s rebels were kidnapping Americans and on the verge of taking power in Cuba. And that was all before Labor Day. Even though the characters in Sputnik Summer live in a small town in the Adirondacks and visit from surrounding cities, they are obviously aware of these events from newspapers, radios, and television news. I didn’t want to shoe-horn these events into the story. So, the headers of each chapter are New York Times headlines from that date. I wanted them to create a tone, a sense, a feeling of the tenor of the times. I also wanted to capture some of the cultural history. Hula Hoops. Elvis. Father Knows Best. The Millionaire. The Beats. The Communist threat. Get rich schemes on matchbooks. Hot Rods. I picked up a number of popular magazines from 1958 and used quotes from them for sub-headings. Which Twin Has the Tony; See the USA in Your Chevrolet; Learn Accounting at Home. Q. What do you want readers to take away from Sputnik Summer? A. First and foremost, I want them to feel they’ve read a good story. I try to make my characters as complex and engaging as possible, but for me telling a good story is the primary objective. Beyond that, I think the core problems of friendship, loyalty, deception, ambition, and deciding who you are going to become are timeless, and I hope I provide a unique and engaging perspective on them. And, I hope within the context of a good story, Sputnik Summer takes on the issues of sexual abuse, the place of gay people in society, and the tensions between the diverse groups in a resort town in 1958. What’s the same? What’s different? And I’ve attended many readings and book discussions where readers surprise the author with what they’ve taken away from the novel. A. I’ve completed a novel in which the main character is a woman who struggles through World War II on the home front and then with a husband psychologically damaged by the war in the years after. While I try to sell that novel, I’m working on a sequel. For more detailed information about Paul Castellani you can visit the Rockefeller College – SUNY-Albany website. This is remarkable and I cannot wait to read the book! You have captured my attention. I have all ready read enough to know that this is a keeper. To be recommended to my book club. A pleasure to meet you in Blue Mountain Lake yesterday, Paul. Hope to see you again some time!